Burn and tone your way to great abs. More is better, unless it's belly fat. Having a plus-size stomach is uncomfortable, and worse yet, unhealthy. Of all the areas to be plus sized, the stomach puts you at the greatest risk of fatal illnesses such as heart disease, type 2 diabetes and cancer, according to Harvard Health Publications. Spot training alone through crunches or other ab exercises isn't enough to reduce belly fat. Toning and reducing a plus-size belly also requires cardiovascular exercise to burn the fat. Burn off belly fat with 30 minutes of intense to 60 minutes of moderate cardiovascular exercise five days a week, recommends the Centers for Disease Control and Prevention. It doesn't matter what type of cardio you do, as long as you get your heart rate up. To avoid boredom, choose exercises you enjoy; consider aerobic dance, inline skating and hiking, for example. Kickboxing and rowing have the added benefit of toning the abs while you burn fat. Do Pilates twice a week. Pilates focuses on core strength and stability and is more effective at engaging ab muscles than crunches, according to Inner IDEA. The most effective Pilates moves are the double-leg stretch, the hundred, the criss-cross, the rollup and the teaser. The double-leg stretch starts by lying face up on a mat with your knees pulled to your chest. Simultaneously lift your head and shoulders off the floor while reaching your arms overhead and extending your legs about 12 inches off the floor. Pull the arms and legs in to return to the start position. Repeat for a set of 10 repetitions. Perform ab-strengthening exercises daily. The abs don't need extra rest like other muscle groups, so you can work them every day. 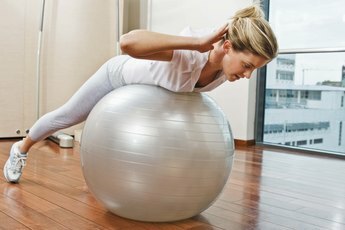 Effective exercises include the bicycle, crunches on a stability ball and planks. Perform the bicycle by lying face up on the floor with your knees pulled in. Use your hands to support your head and neck as you pedal your legs while twisting your torso, reaching your elbow toward the opposite pulled-in knee. If you have knee strain or find the bicycle difficult, pedal the legs toward the ceiling until your abs become stronger. For faster results, eat a healthy, calorie-restricted diet of fresh fruits and vegetables, lean proteins and whole grains. As you lose fat all over, your toned stomach muscles will be revealed. Discuss your plans and goals with your doctor before starting an exercise or diet program. Weight Control Information Network: What Is a Healthy Eating Plan? Does Drinking Water Flatten a Flabby Stomach?